This statement of the "Father of the Atomic Bomb," quoted at the time of its trial in 1945 in New Mexico a fragment of the "Mahabharata" in which, 4000 years ago, an unknown author anticipated and witnessed similar events, hit the mark (the highlighted text), although R.Oppenheimer apparently had something else in mind. Soon you'll see why. A.Koltypin, P.Oleksenko. In a series of articles written by A.Koltypin entitled "Flying vehicles and nuclear weapons in ancient India", and papers by P.Oleksenko "Artifacts of Ancient India", "Secrets of downfall of Mohenjo-daro. Whether the city was destroyed by a nuclear explosion 4000 years ago? ", and articles by several other researchers have presented convincing arguments that the ancient Indians or Aria which, as many believe, were the authors of the Vedas, used in ancient times space ships, flying vehiclesand "weapons of the gods." According to the "Mahabharata", "Ramayana", the Puranas and other ancient Indian texts, the descriptions of "weapons of the gods" are surprisingly reminiscent of modern nuclear, thermonuclear, neutron bombs and cruise missiles, as well as laser, geophysical and climatic weapons. These ancient Indian texts were written between the sixth - first millennium BC (as estimated by different researchers). According to many Indologists, they were based on events that actually took place on Earth. In fact, it is hard to believe that almost half of the narrative of the 18th volume of the "Mahabharata” (which tells about the wars of the gods, demons and ancestors of people with countless varieties of these types of weapons that could "destroy the whole world) is just a fantasy. Could these sophisticated ancient tales of war be just the fantasy of ancient men who used stone, copper, bronze weapons and even iron knives, swords, spears and arrows? How could ancient people invent such fantastic tales of war if they did not witness something like them happening? We must assume the compilers of the Vedas, the Puranas, "Mahabharata", "Ramayana" and their distant predecessors, who for many generations orally transmitted underlying themes of these works, did witness such events with their own eyes and that is the reason for recording them for posterity – events and objects such as space ships, transporting people to other planets, flying vehicles carrying them to work, and, finally, the "six-winged weapon, three cubits in length, terrible impetuous, irrevocable, passionate power of its equally dreadful Thousand-eyed Auchan, acting like a bloodthirsty demon, like Pinax and drive Narayana, fearsome, fatal to all living things". And if this were so, the enormous military battles of the past must have left traces in earth’s terrain (such as craters from nuclear explosions) and the geological record (rocks formed due to short-term effects of very high temperatures and pressures) in many areas of the Earth. However, in the scientific community today it’s still doubted these things have happened. It may be that scientists simply cannot or do not want to see the obvious, because they do not seriously consider the possibility of large-scale nuclear war in the past. In this paper, we have decided to draw your attention to the global spread of one of the most mysterious structures on the Earth – tektites, formed in conditions of powerful short-term effects due to very high temperatures (over 2000 ° C) and pressures (400 000 atm), craters and crater fields without any remnants of meteorites, and related impactites similar to tektites in composition and formation time. According to conventional wisdom, craters, impactites and impact breccias have been formed by asteroid collision with earth. In many cases (the Arizona crater, the crater Kaali, 106 craters from the fall of the Sikhote-Alin meteorite in 1947, etc. ), this seems to be exactly what happened. However, there are a large number of other craters and crater fields, consisting of tens or hundreds of craters of different sizes and shapes, in which are not found a single fragment of an asteroid (meteorite), and who nevertheless are accompanied by impactites and tektites. Such craters and crater fields are puzzling to many researchers. Some believe the crater fields formed by the thermal effects on the Earth's surface of a comet that exploded in the atmosphere. Even more puzzling is the case when only tektites are found. In many places they form clusters and the field is generally not associated with craters, or indirectly connected with them (there are a number of craters, but they have different ages, and there is no model for the formation of tektites that explain the dynamics of their release from these craters.) The chemical composition of tektites is very different from all known meteorites and, according to the American geochemist G.Yuri, is very similar to sandstones and shales (sedimentary rocks) that are found in place next to them. There is evidence that the intense heating of the Earth's surface during the impact of large meteorites has led to the melting of mineral substances near the crash site. 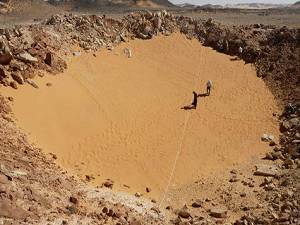 For example, in the desert near the crater Vabara, located 1,080 km east of Mecca in Saudi Arabia, there is evidence a collision caused the melting of the local sand. and finally perhaps the most interesting hypothesis: tektites were formed by unknown processes occurring in an unknown environment. Currently, the most commonly accepted hypothesis is that tektites form from the collision of asteroids with Earth, but it does not explain the reason for the lack of craters in many areas where tektites are found. Neither does it explain the lack of even the smallest traces of meteorites where many craters exist. In addition, tektites are very different in their mineralogical, chemical and isotopic composition from all known meteorites, which is contrary to existing theories about the origin of meteoritic matter. Another fairly widespread conjecture relates the formation of tektites with the explosion of a comet in Earth's atmosphere. However, this is based on a number of assumptions: the material of the cometary nucleus was formed by an explosion or eruption of a planet similar to Earth called Olbers; it was shielded from all sides from cosmic radiation by a hard ice shell; the comet entered the atmosphere at a gentle angle (12-13 degrees, such as the case of the largest Australian - Asian tektite belt); the cometary nucleus in the atmosphere broke apart and fell to earth as several individual compact swarms of debris. As rightly noted by tektite expert E. V. Dmitriev, all these conditions occurring simultaneously would be incredible. Hence, it remains that scientists still do not know anything about the nature and origin of tektites. Comet hypothesis of the formation of tektites based on unpopular conjecture among astronomers that tektitic comet fragments are not proto-planetary nebula or interstellar wanderers but are recently formed within the solar system. More or less similar to tektites (along with some occurring in craters impactites, differing from them only in the presence of inclusions of foreign material (substrate) and the different composition and pressure of gas bubbles) is trinitite, also known as Alamogordo glass or Kharitonchik, which is arkosic sand glass slag from the explosions of atomic and hydrogen bombs landfills in New Mexico, Nevada, Semipalatinsk, Novaya Zemlya and other places. Maybe they are the key to unraveling this phenomenon and may provide an answer to the question of what exactly were the "weapons of the gods" in ancient India (read here). On the ground, nuclear and thermonuclear explosions create a fireball with temperatures over 1000 ° C, and all material that is in the vicinity (including soil, rocks), evaporates or melts to the amorphous state. 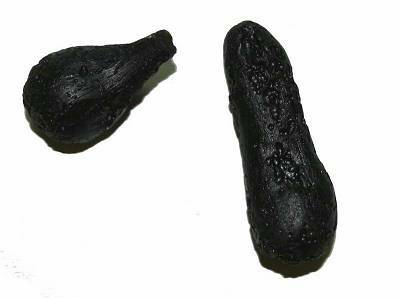 At a distance of 1 km from the blast the temperature reaches 1800 - 2000 ° C.
Objects similar to tektites called "black stones" are found in large numbers on the streets of Mohenjo-Daro. The results showed that they were fragments of pottery, sintered at a temperature of 1400-1600 ° C.
Tektites and impactites are considered by E.V.Dmitriev in his article "The appearance of tektites on Earth" and P. Oleksenko, "Lonar Crater - evidence of a nuclear war in ancient India", so to re-examine their composition, structure and assumptions here is not necessary. In this paper we touch on a few important points that shed light on the origin of tektites and also tell you about the craters and the crater and impactite fields whose origin is not associated with falling asteroids. The word tektite is from the Greek word tektos - "fused," proposed by Australian geologist E. Zyuss due to the fact that the smooth glass surface is always fritted. Tektites are very diverse in form and color: the fragments, buttons, weights, beans, pear-shaped body, tears, boats, hollow balls, cannon balls, discs, plates, hands painted in black, dark green, dark brown, greenish-brown, light green, light yellow, white, sometimes almost transparent. Their weight ranges from 0.05 g to 3.2 kg. They are most frequently found at a mass of 1-5 g and the majority of tektites have a form similar to a quickly frozen viscous droplet that has been frozen while still in flight. The surface of many samples shows evidence of high-speed processing (several kilometers per second), including gaseous flow, while at the same time, they do not have even the slightest traces of the impact of space radiation. Petrographic and chemical characteristics of tektites indicate that they formed as a result of rapid cooling from a high temperature at a melting point above 2000 ° C, indicating catastrophic character. Gas inclusions in impactites contain air bubbles trapped in the melt with oxygen and nitrogen in the same ratio as air, indicating that the formation of the glasses occurred in the Earth's atmosphere. Other inclusions in tektites are composed mainly of carbon dioxide displaying an environment reminiscent of the atmosphere of Venus, and in some varieties of tektite glass there is also an essential component of hydrogen. The pressure of the gas mixture in the inclusions is much lower than the pressure of the atmosphere. In Vietnam tektites are found with extremely fragile and thin, long tails, which when dropped from a height of 1 m are broken down into the carpet. Tektites are found in Tasmania (darwinites), Australia (australites), Indonesia and Malaysia (yavanites, billitonites), Thailand, Cambodia, Laos, Vietnam (indochinites), the Philippine Islands (philippinites, risolits), India, West Africa in Cote - d'Ivoire (Ivory Coast tektites), Libya and Egypt (the Libyan glass), Colombia, Peru, the U.S. states of Georgia and Texas (bediasites), the Czech Republic and Germany (moldavites), Kazakhstan (zhamanshinites, irgizites). The largest Australian-Asian tektite belt is 10,000 km long with a width of 4000 km extending from Tasmania to southern China and according to studies done by E.P.Izoh extending to the Aral Sea in Kazakhstan (crater Zhamanshin). 90% of all tektites are concentrated in the Philippine Islands, Australia and Indochina. Stray fields of tektites in the area of hundreds or thousands of square miles usually has a concentric structure. The center finds more, they are larger. There are fields in the form of bands, especially in the Australian-Asian belt. Tektites within individual fields have the same origin and age. The density of finds is different from a few pieces per square meters to a few pieces per square mile. Sometimes they are found in higher concentrations of up to several kilograms. Stray fields of tektites, except for the moldavite fields in the Czech Republic, Ivory Coast tektites and Libyan glass in Egypt and Libya, do not show any connection with craters. But even in these cases, despite the presumed age of the tektites and the same craters, researchers cannot explain the expansion of the melt from the crater to a distance of hundreds of kilometers, followed by precipitation of compact swarms of tektites and their absence in the very craters and the surrounding area (the craters Rice and Shtenheym in Germany and moldavite, located in the 250-400 km from each other, the crater Bosumtvi and Ivory Coast tektites, located 280 km from each other). Although in Rice and Bosumtvi craters there are found black glass (impactites), which have petrographic similarities and are coeval with tektites, especially indochinites and philippinites and impactite bombs and lapilli (molten spray thrown up by the explosion of the craters) occur at a distance of 10 km from the crater of Figure . It is believed that small splashes of impact melts could not sustain such a long trip because air friction would cause them to completely evaporate. Of all known craters at the present time, only the craters Zhamanshin in Kazakhstan and Lonar in India contain tektite-like glass (zhamanshinites, irgizites, maskelynites), at that zhamanshininites and irgizites have similarities with Vietnamese tektites (indochinites) of the Muong Nong type. The study of tektites shows that they differ greatly in their mineral, chemical and isotopic composition from all known meteorites. Tektites are enriched in silica (SiO content of 68 - 83%) and contain 10-15% alumina, 2-5% iron oxide and small amounts of potassium, magnesium, calcium, and titanium. As we have said, these glasses are not found among meteorites. Present in tektites of some regions (of) scattered magnetic nickel-iron balls, and in moldavites - hydrocarbons of inorganic origin, however, still retain a hope at researchers that they can have a cosmic origin. The chance for this increases with the detection of anomalies in iridium found by E.P.Izoh in tektite-comprising layers of both Vietnamese craters and Zhamanshin crater in Kazahstan (10-millennial age, according to his definition). F.Yu.Levinson-Lessing, petrographer with the Russian Academy, in turn proved in 1935 that terrestrial magmatic rocks, similar to tektites, do not exist. Thus the main criterion for him was a higher content of oxides of divalent metals (Fe, Mg, Ca) compared to the amount of oxides of monovalent metals (Na, K) with an unusually high content of silica - relationships "prohibited" (not found) in terrestrial igneous rocks. 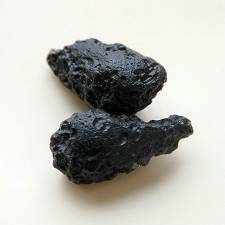 Tektites differ from volcanic glasses in having a very low (less than 0.01%) water content. They also contain 1.5-4.0 times more rare earth elements than any natural glasses and an abnormally high ratio of thorium/uranium of 10-12, while in volcanic glasses, this ratio is close to 5. The possibility of forming tektites by re-melting of terrestrial rocks was first described in 1933 by L.Spenser. 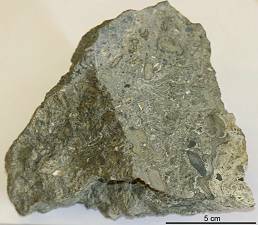 A series of articles from the late 50s by American geochemist G.Yuri showed that they could be a sedimentary rock - a mixture of sandstone and shale with a chemical composition similar to tektites. However, tektites containing short-lived cosmogenic isotopes Al26 and Be10 require further explanation. On the one hand, they seem to be evidence in favor of a cosmic origin of tektites. On the other hand, the young age of these isotopes (only a few thousand years old) suggests they did not spend too much time traveling thru space and could be delivered only from the moon. However, tektites are very different from lunar rocks (in the lunar soil 40-50% silica is found). And the age of meteorites containing such isotopes are in the hundreds and thousands of millions of years. Tektites are found only in Cenozoic sediments, and their age does not exceed 34-35 million years. At the same time, the age of the majority of known meteorites is more than 4 billion years. Tektites are subdivided into four age groups: 34-30my (North American tektites), 15my (moldavite), 1.3my (Ivory Coast tektites) and 0.7my (Australian-Asian tektite belt and zhamanshinites). Attention is drawn to the so-called age paradox of tektites - different ages of the tektites and the geological horizon of their occurrence. Thus, the age of the Australasian tektite belt is about 0.7 million years (from 0.68 to 0.99 million years, according to EP Izoh, from 0.4 to 11 million years, according to other sources) and the age of the geological horizon of their occurrence is estimated at only 5,000 - 15,000 years. EP Izokh significantly narrowed the interval and showed that the majority of Australasian tektites lie in layers dated to the boundary of the Pleistocene and Holocene age of about 10-12,000 years ago. A similar age (from 0.73 to 1.01 million years, according to E.P.Izoh, to 2,45-2,7 million years, according to other sources) is obtained for zhamanshinites and Zhamanshin irgizites from the crater in Kazakhstan, and they also occur (as a result of years of research and data gathered by E.P.Izoh and V.S.Volkova in 1990), in a layer that has accumulated in the boundary of the late Pleistocene and Holocene. According to E.P.Ezoh (1990) the impact layer can be traced for 200 km from the crater and is enriched with iron, manganese, nickel and chromium with small amounts of carbonaceous matter. Read the work by A.Koltypin "Mineral oil (petroleum) and coals with heightened contents of uranium, vanadium, nickel, iridium and other metals - the sediments of epochs of "nuclear wars"
Geological Faculty of Moscow State University forum's member Yaroslav Smirnov, favoring the formation of tektites from thermonuclear explosions (surface or air), believes that the tektite age paradox (age of glasses determined by potassium-argon method is appreciably higher than the surrounding rocks and the estimated time of crater formation) can be explained by high levels of ionizing radiation, primarily gamma and neutron radiation at the time of the formation of tektites. In his view, under neutron irradiation the rate of radioactive decay of potassium is accelerated, and the sample can "grow old" (give a greater appearance of age). A similar age-paradox is observed in many impactites (eg zhamanshinites) that, despite their resemblance to tektites, are still more correctly classified as impactites. Enclosing tektites and impactites, sediments of the walls and the bed of craters and adjacent areas in the minimum degree are prone to this paradox due to the fact they have strongly impaired radioactive radiation. In order to understand how much impairment has occurred consider the following example: a concrete layer with a thickness of 1 m reduces the neutron emission by 150 thousand times, and if 2 meters thick by 22 billion times, which is basically a reduction to zero. We, A. Koltypin, P.Oleksenko the authors of this work, and L.Fitzpatrick the translator of this work, give permission to use this for any purpose except prohibited by applicable law, on condition that our authorship and hyperlink to the site http://earthbeforeflood.com is given. Read my works "Attack of gods. Nuclear, laser and other superweapon", "Extermination of people by Hathor and Libyan Desert Glass", "Who was a side losing (Who was lost) nuclear war 12,000 years ago? The legacy of the past in Australian legends", "Eleven glaciations in the Quaternary time - the wars for world supremacy between Pandavas and Kauravas" и "Nuclear weapons - a direct threat to human existence"
Read P.Oleksenko's works "Lonar crater - the evidence of a nuclear war in ancient India", "Secrets of the downfall of Mohenjo-daro. Whether the city was destroyed by a nuclear explosion 4000 years ago?"